Prime Minister Narendra Modi Friday declared that the country will no longer be "helpless" in the face of terror, saying a 'New India' will pay back terrorists with 'interest' and that their influence has been curtailed and will be curbed further. Modi also accused some opposition parties of doubting the armed forces and his government's fight against terrorism, saying their statements are helping Pakistan and harming the country. Telling opposition parties to stop weakening India with their statements to strengthen their own own politics, the prime minister said, "Modi will come and go, India will remain." He did not name any party. 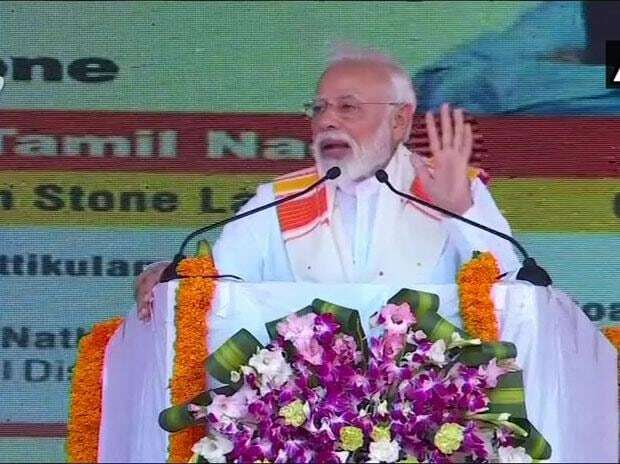 Addressing a public meeting here, the prime minister also hailed Wing Commander Abhinandan Varthaman, saying every Indian was proud of him. "Every Indian is proud that the brave wing commander Abhinandan belongs to Tamil Nadu," he said after inaugurating several government projects in the Rail and Road sectors. Modi said he is proud that India's first woman Defence Minister Nirmala Sitharaman is from Tamil Nadu. Reiterating his government's resolve against terrorism by retaliation, Modi slammed the previous Congress-led UPA government for not following such aggressive tactics and accused it of "blocking" surgical strikes post 26/11 Mumbai attacks in November 2008. The country has been facing the menace of terrorism for years "but there is a big difference now..India will no longer be helpless in the face of terror," Modi said. "This is a New India, this is an India that will return the damage done by terrorists with interest," he said, adding, "influence of terrorists and terrorism is curtailed and is going to be curtailed even more." The events of the past two days, an apparent reference to IAF's air strikes on a JeM terror camp inside Pakistan and the IAF shooting down a Pakistan jet, have demonstrated yet again the strengths of the country's armed forces, he said. "It has also brought our nation closer," the prime minister said, an obvious pointer to the outpouring of support to Varthaman and India's armed forces from the people. However, he said, it was sad that a few political parties "suspect our fight against terror." When the entire nation supports the country's armed forces, they "suspect the armed forces," he said. "These are the same people whose statements are helping Pakistan and harming India. They are the same people whose statements are happily quoted in the Parliament of Pakistan and in the radio of Pakistan," Modi said. "They should clarify- do they believe our armed forces or they believe those forces who support terrorism on our soil? "I want to tell them- Modi will come and go, India will remain. Please stop weakening India to strengthen your own politics,"he said. "We are Indians first and your politics can wait...it is the safety of our nation that is at stake," the prime minister said. He asserted that the entire world was supporting India in its fight against terror. Citing reports, the prime minister said though the Indian Air Force wanted to carry out surgical strikes post 26/11 Mumbai terror attacks, "UPA blocked it." "The nation expected those responsible for these acts of terror to be punished but nothing happened. 26/11 (Mumbai terror attacks) happened in India but nothing happened," Modi said. "And today we are in an era where the news reads armed forces have full freedom to do what they want." He rued the bomb blasts at Hyderabad, Delhi, Mumbai, Bengaluru and Pune between 2004 and 2014 when the UPA was in power. "But when Uri happened, you saw what our brave soldiers did (surgical strikes), Pulwama happened, and you saw what our brave air warriors did (Balakot air strikes). I salute those who are serving their nation. Their vigilance keeps the nation secure," he said. Modi also said the upcoming Lok Sabha elections was about offering strength against vulnerability, asserting the BJP-led NDA would provide stability. spoke out about the economic culture of Congress, it was son of Tamil Nadu C Rajagopalachari. "We are fulfilling the dreams of Rajaji by creating an economy that is reform oriented and people friendly," Modi said.